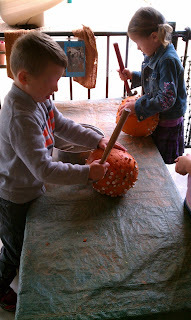 After seeing this "pumpkin hammering" activity on the 'blogosphere' several times, I decided to try it out in our yard. 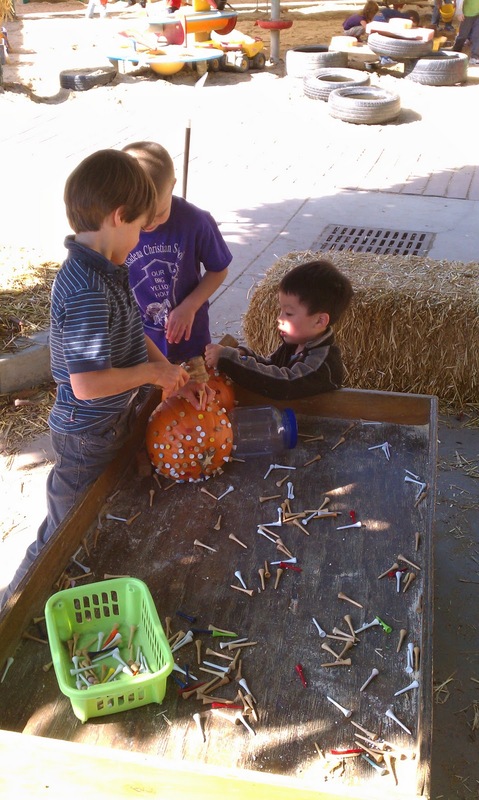 We set out two pumpkins, four small wooden mallets, and a TON of golf tees. The children REALLY enjoyed this activity and they were very successful at pounding the tees into the pumpkins. 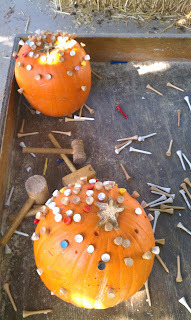 They even branched out and pounded tees into our giant pumpkin and ornamental squash (oops!). It was a fantastic skill building activity for all the children in our program (ages 2-5). Unfortunately, our fun was cut short. We have one naughty little squirrel that adores the dollar store pumpkins (yup...ONLY the dollar store pumpkins!) and during nap time, when the yard was quiet, he came to find the feast that we had so kindly laid out for him (ha!). As he had done to five of our previous pumpkins, he gnawed a huge hole into one of the ones on the table! 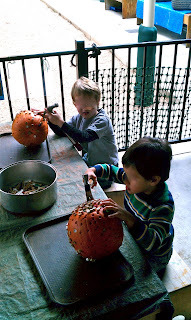 So, we were down to one hammering pumpkin (which, by the way, I kept in the fridge that night for safe keeping). Sniff! Once every tee was pounded in, it was time to take them out. YIKES! No one mentioned how terribly hard this task was!!!! So, the pumpkins sat on my counter until I found a hammer. I pulled out a few tees myself, and then realized what a great activity this would be for the children. So, during "patio time" (which is a more controlled atmosphere than the big yard), the children got to pull the tees using the backside of the hammer. It took them some time and thought to figure out how to wedge, pull, and lift the hammer correctly, but they did it. 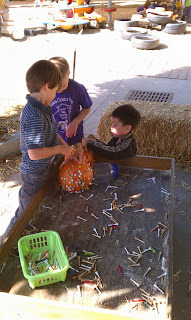 Several of the children spent a lot of time on this activity. We even had one three year old dedicate half an hour to this activity. 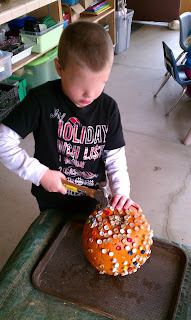 It was a wonderful fine motor and problem solving activity for the children. It was also a fantastic finger-saver for me! Love it - and yes no one mentiones how hard & sore it is to get them back out again! 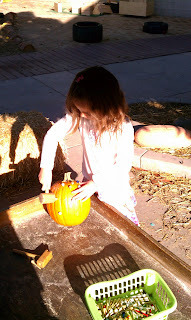 Isn't it amazing to think that thanks to the blogosphere pumpkins were pounded on nearly every continent!! SO true! It is amazing that with the click of a mouse, the entire world is connected! Oh, how they loved pounding the tees in - but no one wanted to help me pull them out again. LOL After three days of very sore hands, I realized that the fun for the students was worth all of my sore fingers! Thanks for this great idea!